For this weeks assembly, our green schools committee addressed the school about the surveys that they will be asking each classes. 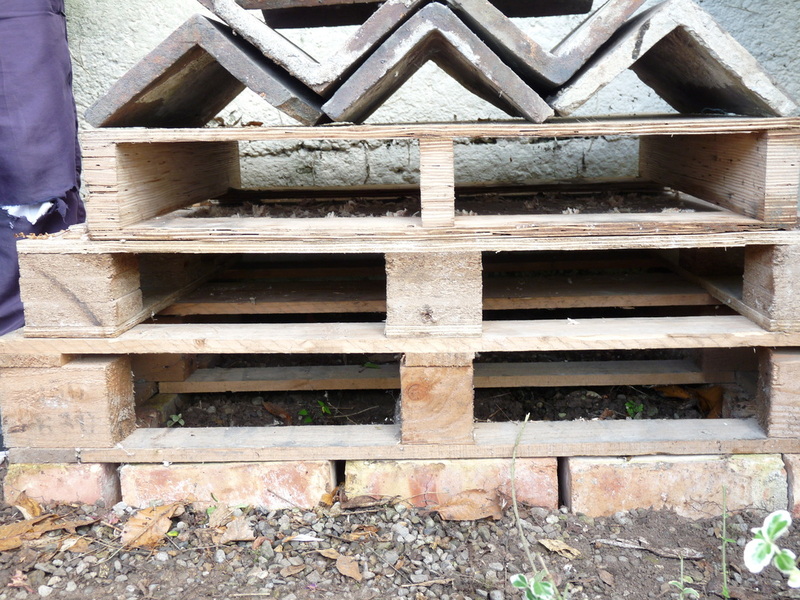 Step 2 of green school programme is an environmental review. We will be giving out a survey to all senior pupils on Tuesday to assess what we already know about global citizenship litter and waste. We ask you all to be honest with your answers. Please don't attempt to copy other pupils answers because we need to know what improvements we can make in our school. The Green Schools committee are asking Mr Dunne if he wouldn't mind giving some class time to allow the survey to be completed. The pro's will collect the survey on Wednesday. So we hope you will find the time to do this and we thank you for your co-operation. When we get the results of the survey we will put them on the noticeboard. This will form our new action plan. We hope you will co-operate with us. Recently in our Friday assembly, the new Green Schools Committee addressed the school for the first time. "The 1st step for all Green Schools themes is to form a committee. This is a group of pupils willing to work together to promote our new theme and organize activities to encourage us all to participate. Let me introduce you to the new committee who all volunteered for these roles. 3: PRO's- Calum, Grace, Cathal." "As chairperson, I will try to help to keep order in our meetings and help to ensure the ideas of our committee are carried out. For every Green School theme, we must follow 7 steps. The formation of the committee is the first step, and we are now beginning work on step 2. Jake will tell you more about this." "Our environmental review is a very important part of beginning our new theme. We will be doing a survey in each classroom to find out exactly how aware we all are of what the new theme is about. When we complete the survey, we will then plan some action to help us to improve in this area during the next 2 years. We hope we can rely on all of you to support our ideas." "I'm the new secretary and I will be responsible for taking notes at our meetings. We call these notes the minutes. I will also be in charge of emailing or contacting people outside our school with Mrs. Kealeys help whenever necessary." "Our new theme is Global Citizenship with a special focus on litter and waste. We will soon be displaying our action plan on our notice board to help everyone see what actions we plan to take to help us achieve our next Green Flag. So, keep an eye on the board over the next few weeks." "The first aim of our committee this year is to raise awareness about how looking after our environment helps people all over the world. So over the next few months we will try to find out how our actions in Seir Kieran N.S can affect the lives of people in other parts of the world. Of course we want to have a positive effect, but maybe sometimes, that is not the case. We will keep you posted maybe you can already think of ways that we do this already." "In every community it is important that each person plays their part. We will be asking all of you to think about ways you can help to make our school community better and then the wider community of Clareen better. Finally we also want you to be part of the global community. We call this global citizenship. We hope you will become more aware of what it means to be a good citizen by taking an active part in our Green Schools programme"
"No matter what task we are given, its important how well we do it, or could we do it better. This is what step 4 is all about. So yes, we will be keeping an eye on how you are doing. So lets get going on our litter and waste theme by first getting our bins sorted once and for all. We might need to start in the staffroom." "Step 5 involves curriculum work. we think it will be fun and interesting to learn what happens to waste which goes to landfill, clothes that are recycled or metals that are re-used. We think it could help us be more caring of our environment if we knew we were doing some harm. 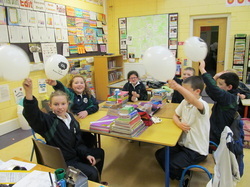 We would like to preserve our world for all to enjoy so we need to learn about it in geography, science and SPHE." "Step 6 is called informing and involving. How can anyone help if they are not told what needs to be done? How will it be done if no one is willing to do the work? It's up to each of us to help out. Our P.R.Os will help keep you informed, but only you can get yourself involved. Don't leave it to everyone else." "As P.R.Os, we will visit your classrooms to tell you about our activities, or to ask for your help. We will try also to keep others up to date with our website and through the school newsletter. If you have any ideas you think might work, please share them with us." 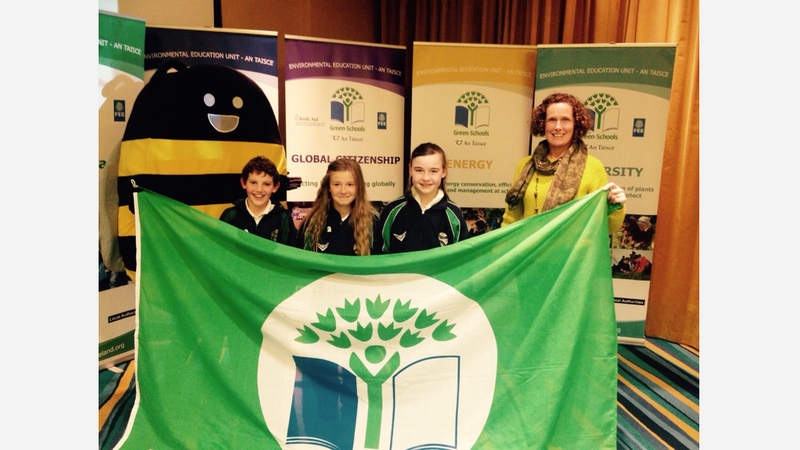 On the 18th of May, Mrs.Williams , Leo , Aoibhe and Naomi headed off to Athlone to the Green Flag presentation day. 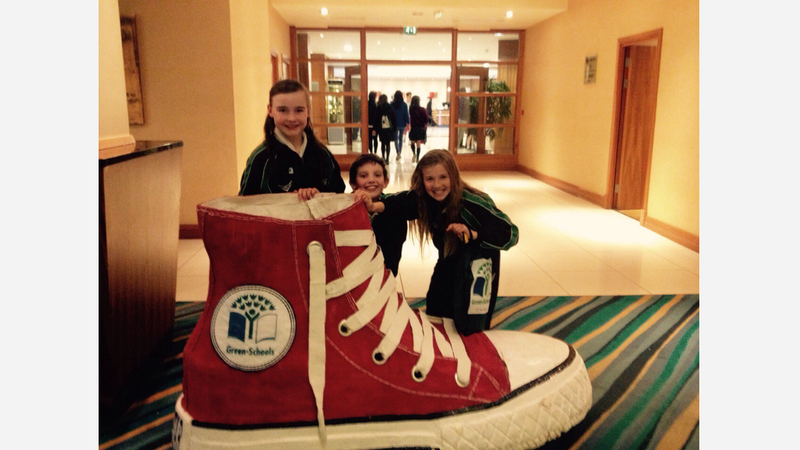 On the bus they collected Dromakeenan N.S., Drumcullen N.S., Mercy Primary School and Broughal N.S. When they reached their destination they walked inside with all the other schools. They went into the presentation room and waited for a while. Representatives from An Taisce presented the flags and certificates to each of the schools. Leo received the flag for our school and Naomi received the certificate. They also met Mika there and she was dressed as a bee. Next they had their dinner and the waitress spilled the food on Naomi !!! They really enjoyed the day especially making new friends on the bus. Guess what we are learning in school? It's something really, really COOL ! We had a very interesting and enjoyable visit from Mr.Dale Treadwell in February. He came to talk to us about Biodiversity and to help us begin planting a butterfly and bee patch. He visited each classroom and showed us some photo's. He also used a piece of string to show us how we are all connected in the world of nature. The Green Schools Committee also had the chance to ask him questions about the trees and plants growing in our garden. On March 6th we are planning a fun filled day. We hope everyone will come in fancy dress based on Biodiversity. Our senior pupils will be having a debate about biodiversity which all the school will be able to listen to. We are also hoping to hold a table quiz for all pupils. Our new school nature trail is now ready for everyone. We hope all classes will be able to learn lots about our school environment. Finally hope to finish with a WOOF ! 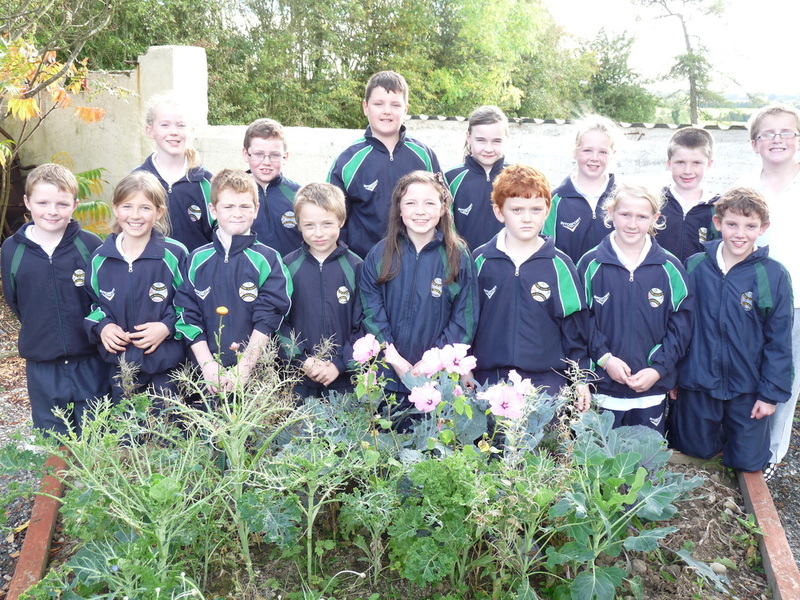 This is the new Green schools committee for 2014/2015. We are working hard toward achieving our 5th Green Flag for Biodiversity. 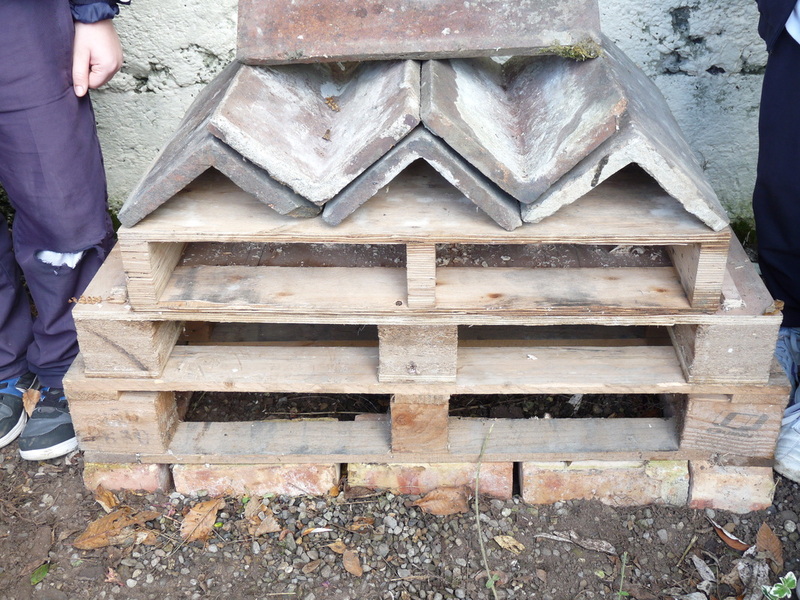 Our first project this year was the creation of a Bug Hotel ! 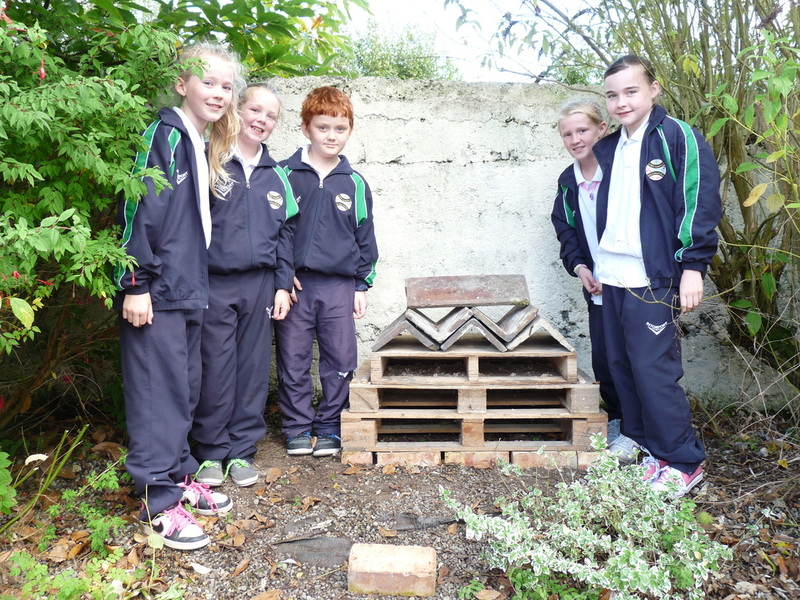 We have built this in the school garden. We look forward to the arrival of some insects and hope to upload pictures of our creepy crawly guests . Step 1:We had to set up a green schools committee. Step 2:We had to do an enviromental review. Step 3:We had to make out an action plan. Step 4:We had to evaluate and monitor our progress. 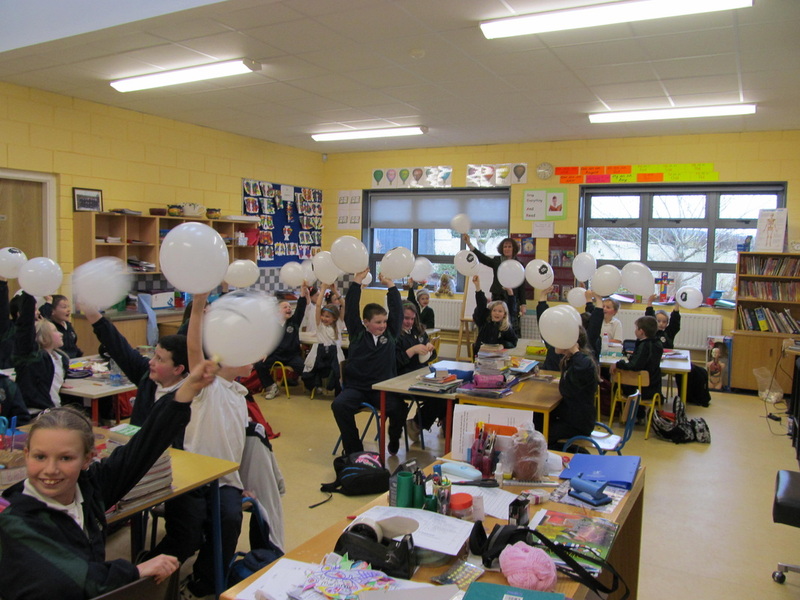 Step 5:We had to integrate environmental issues into lessons in each classroom. Step 6:We had inform and involve the wider community. Step 7:We had to create a green code. It is cool to walk to school. wearing my bright red hat. They will make you full of pride. They save time and space. They might even save the human race. Written by Cathal Bergin 1st class, Naomi Mooney 2nd class, Rebecca Ryan 2nd class. 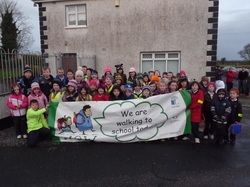 Each Wednesday we make a conscious effort to walk to school to help the environment. 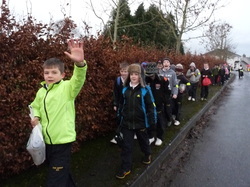 Pupils parents and teachers walk , cycle , car pool , park and stride or take the bus. We had a visit from Mieka. She helped us to carry out an experiment with balloons. We found out how much CO2 is released by a car travelling from our school to the cross.